Stairs are everywhere -- from your home and workplace to malls or hotels. Although you may be tempted to avoid the stairs and hop on an escalator or elevator instead, taking the stairs can actually increase your calorie burn for the day. In fact, if you walk up stairs enough during the week, it can actually help you lose weight. Walking up and down stairs qualifies as an aerobic exercise activity. With each step you take on the stairs, you work the muscles of your legs using up energy. To continue working, your body must use or "burn" macronutrients either through the foods you have recently eaten or through accessing stored fat. To access this energy, oxygen must be present. This results in the increased heart and breathing rate needed for aerobic activity. When your body burns more calories than you take in through your daily meals, a calorie deficit occurs. 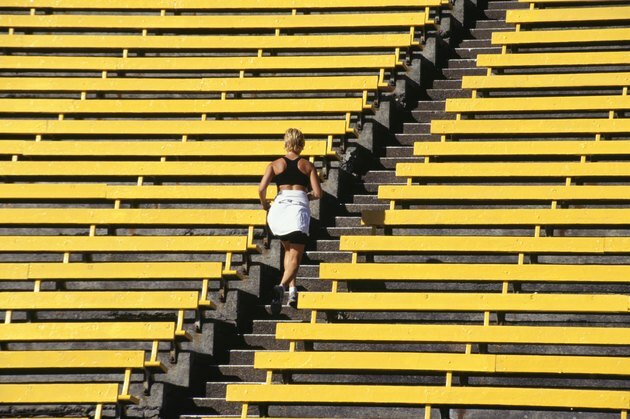 To continue climbing the stairs, your body must access fat calorie stored in the cells of your adipose tissue. To access these calories, your body produces hormones which activate lipolysis, a process which breaks the fat down into glycerol and fatty acids. This is then converted into acetyl-CoA through beta oxidation and glycolysis. The acetyl-CoA enters the Krebs cycle which exposes the remaining product to oxygen to create energy. The creation of energy also creates by-products of heat, carbon dioxide and water. The heat is used to maintain your body temperature while the water is removed through your urine and sweat. Finally, the carbon dioxide exits the body through your lungs as you exhale. The removal of these products from your body results in physical weight loss. The average 155-lb. person can burn an estimated 223 calories per 30 minutes of walking up and down stairs, according to Harvard Health Publications. This number can vary, depending on your individual weight, the number of stairs, as well as the speed in which you ascend and descend the stairs. Not only can walking stairs help you lose weight, but it also provides other aerobic benefits which can have long-term positive effects on your overall health. For example, the aerobic exercise obtained from walking stairs can help reduce your risks for developing several chronic diseases including heart disease, diabetes and even some forms of cancer. How Long Does It Take for Excess Calories to Turn to Body Fat?